ICANN has declined an invitation from the Obama administration to attend a meeting tomorrow to discuss ways to crack down on counterfeit drugs web sites. The meeting is reportedly part of the administration’s Joint Strategic Plan to Combat Intellectual Property Theft, which was announced in June. It also follows a series of reports from security firms that called into question domain name registrars’ willingness to block domains that are used to sell fake pharma. ICANN tells me that, following talks with White House Intellectual Property Enforcement Coordinator Victoria Espinel, it was agreed that it would “not be appropriate” for ICANN to attend. The decision was based on the fact that ICANN’s job is to make policy covering internet names and addresses, and not to regulate the content of web sites. I suspect it also would not have looked great on the global stage if ICANN appeared to be taking its policy cues directly from the US government rather than through its Governmental Advisory Committee. Demand Media-owned registrar eNom, which has took the brunt of the recent criticism of registrars, recently signed up to a service that will help it more easily identify and terminate domains used to sell counterfeit medicines. FDA to get domain name takedown role? No, wait! I thought ICANN’s mission is to “promote competition?” Oh, no. It only coordinates the internet’s unique identifiers. Plus, it monitors and enforces Registrar Accreditation Agreement – or does it? It seems in the news recently some small Registrars lost their accreditation by ICANN from violating the agreement . . . is that not “outside the scope of the role of technical coordinator?” ICANN is trying to duck liability because it won’t do its job! I think that ICANN has no other option. Imo this is not a task for ICANN. Let me explain. I live in the Netherlands and when it comes to softdrugs we have a liberal policy. Now what if the ICANN receives complaints from some groups located in the USA regarding some websites that offer information about softdrugs.. As soon ICANN regulates this and pulls the plug on those domains they will directly violate several Dutch laws. When it comes to these rogue pharamcies. The solution is that Russia (and other countries in the world that allow this) change their laws so it becomes illegal. Perhaps this whole thing shouldbe pushed to the United Nations. Course this is not something that willbe solved within the next 2 years. ST, for reasons listed in this post: http://www.circleid.com/posts/20100929_policy_failure_enables_mass_malware_part_ii_icann_and_onlinenic/ these issues are right on ICANN’s doorstep. The impetus is the global trade in illegal, counterfeit drugs but the underlying cause is ICANN’s failure to enforce their own contracts. I thank Mr. Murphy for posting a link to this article on the Comments section of my BlueMauMau.Org posting. Mr. Murphy has provided valuable background information on this matter of significant public interest. After I wrote a blog (which was primarily focused on the threat to free speech) I got a phone call and subsequent emails from John Horton of LegitScript.Com; in those emails he states that he intends to sue me for defamation. The emails are posted in their entirety on BlueMauMau.Org. For the US government even to hold such a meeting at the White House rather than at some agency office is itself a signal to foreign governments and I suspect the White House did not think thru the implications of this action. Kudos to ICANN for steering clear of this landmine. I really do not understand what If my target market is not USA ? I mean if I want to do business else where and not USA but my website carries prescription drugs.. How in the world can some agency from US try and take the domain down just because our site carries prescription drugs. If they are so very concerned about the safety of people of America then the government should act tough on those who import drugs from outside. Can they do that ? I don’t think so.. because the prime motive of these agencies are not the safety purpose but to have the reputation with big pharma companies intact. No ICANN represented . . . tickles me! I read the article. No idea what you want me to say about it. 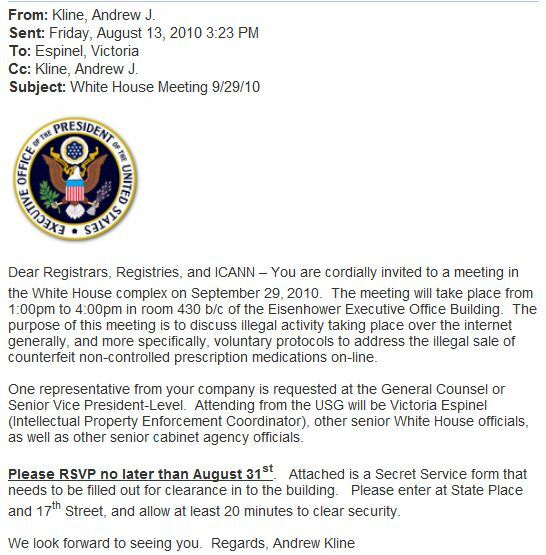 The fallout that ICANN snubbed the Whitehouse on the counterfit drug meetings extends to the current agenda: ICANN is not going to be invited back. That’s what I want you to confirm, starting with ICANN is not present at today’s meeting. I don’t really understand what you’re getting at, sorry Louise. Why should ICANN care about the dinner described in that article? It doesn’t seem to me to be relevant to its mission. ICANN morphs its mission to suit its needs to award beneficial policies to its insiders. In the post above, ICANN begged off participating, saying it only exists to oversee allocation of domain addresses, in the most administrative sense of the word. Then it overrides objecting comments on huge aggressive policies to “Introduce and promote competition in the registration of domain names where practicable and beneficial,” a switch from the above – which is it? Since ICANN wants to align itself with and take credit for the success of the internet, I’m sure it’s bitter to not be included on the list tonight.